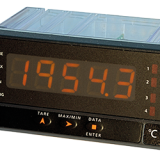 Digital indicator for operating as an industrial visualiser or repeater controlled through RS485 or Ethernet networks and MODBUS RTU/TCP/IP and ASCII communications protocols. 5-digit indicator with 14mm digit height, it has 6 adjustable display brightness levels and is also configurable in 3 colours. AC/DC or power supply for a wide range of voltages and fully programmable through 3 frontal keys. The indicator can be configured to work as a master or slave.